This is a blast from the past. You can search a person's first tweet on twitter. 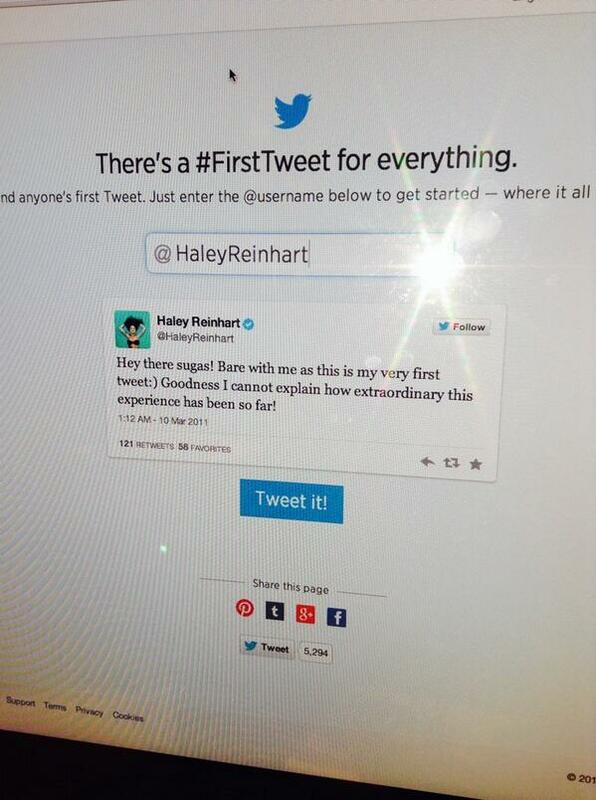 This tweet is from Mar 10, 2011 and is apparently the first time Haley sent out a tweet. Hey there sugas! Bare with me as this is my very first tweet Goodness I cannot explain how extraordinary this experience has been so far! That shows ya how much I know bout twitter. Mike Mitchell is a safety in the NFL who signed to the Steelers last month. He played for Carolina last season. Was drafted by Oakland in 2009. I assume he bought a home in Southern California then. Thanks Guys So Sweet of u Even on AJs Bday! "@HaleyReinhart @MikeMitchell34 Ey Thank u & ur boys for lunch! Fun game u guys got goin haha "
Whaaaa????!?! No way I wasn't online to see it!! YAAAY!!! !